With this game the blog enters 1993. 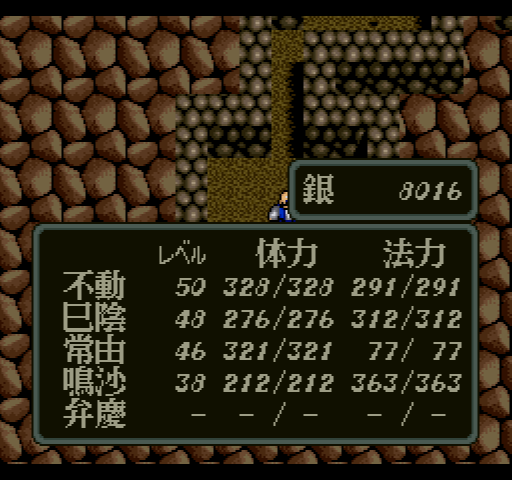 This is the year that SFC RPG production really ramped up, although not quite as heavy as 1994-5. Elfaria has actually been reviewed by two other bloggers, Boxed Pixels (which is still active), and Random Encounters (which is not). Both of them hated the game. I can understand why, although I'm actually enjoying it so far. 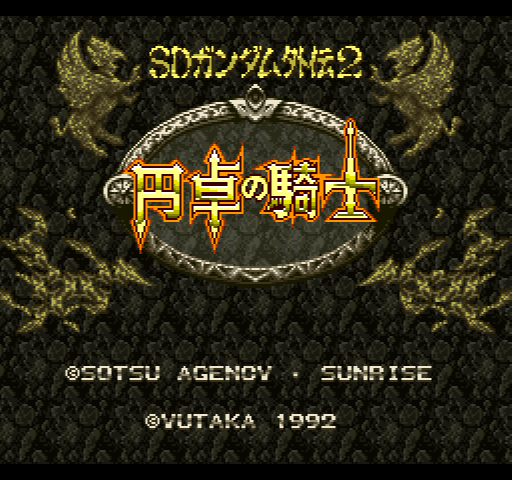 It's possible I like it more than I should because of all the crap I've played, but it seems to have had a pretty decent reputation in Japan and got a sequel in 1995. The biggest roadblocks for most players are going to be the battle system (which is almost completely automatic) and the lack of experience and gold. It reminds me a bit of Ogre Battle although it's been so long since I've played that I don't have a clear memory of how much control you had over the battles. The characters have a distinctive style, done by the artist Susumu Matsushita. He is known for an American comic-influenced style, which reminds me somehow of the Foglio's work even though it doesn't look exactly like it. In any case it's not the usual anime art. The game begins with a cinematic opening and then the introductory story. 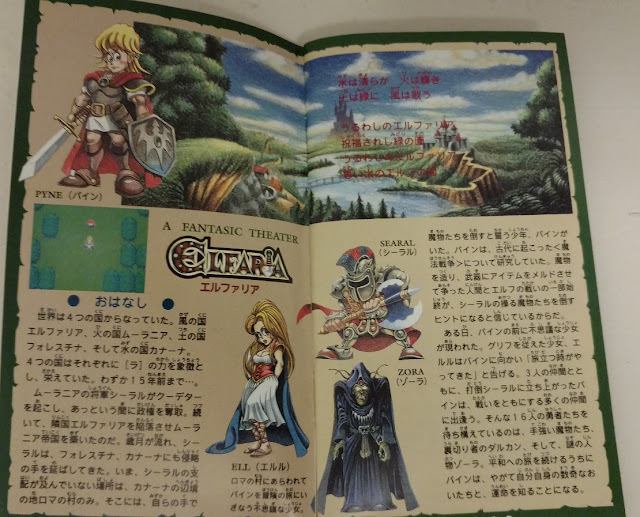 Elfaria has been almost completely taken over by Searal in the last 15 years, with only the small town of Roma left over, where our hero Pyne is from. He has been researching the long-ago magic wars and thinks the legends from that age can help him overcome Searal's forces. Suddenly a woman named Ell appears before him and tells him the time to set off on his journey is here. She disappears, and Pyne takes three companions and sets off. Eventually we will end up with 4 parties of 4 characters each. The story so far is not especially detailed -- there's not much else to say beyond that opening story. I've completed chapter 1 and there was a bit of development with the mysterious Zora on the enemy side, but not much. After the initial scene you then start the game. 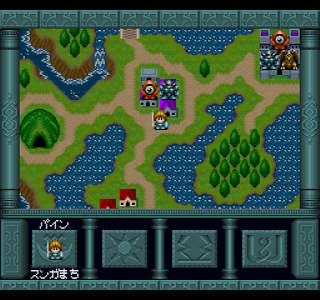 The basic gameplay involves recapturing towns from the evil forces. The game is divided into chapters, with each chapter being a different continent of the world. You start with just Pyne's party, and move him to the next town where there's a boss. Once you reach a town, you can enter it and then walk around an area with random encounters and chests until you find the boss and defeat it, which then frees the town. The "Rod X"/"Mail X"/"Sword X" items just increase the relevant stat and do nothing else. Other items increase multiple stats or add special abilities. You can also find recipes to combine several items into one, although you sometimes have to go to a specific person to forge it. The meld system is a lot of fun -- it's not flexible in the sense that you can turn a mage into an effective fighter, but it gives you a little more freedom than just equipping a new armor or staff. The sticking point for a lot of players is going to be the auto-battle system. 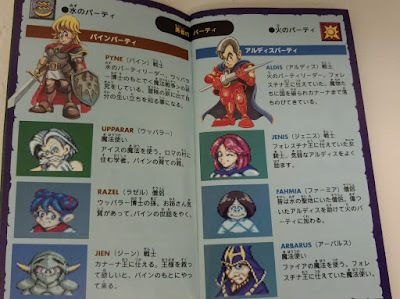 Each party has 4 members. The two front members are fighters who attack. The other two are magic users. One has an elemental damage spell and a debuff, the other has a heal spell and a buff. Your only control in the battle is choosing between the buff, debuff, and damage spell (or nothing), and running by pressing down. Everything else is done automatically. The buffs and debuffs do not take MP but the mage can't use them if they have 0 MP remaining. 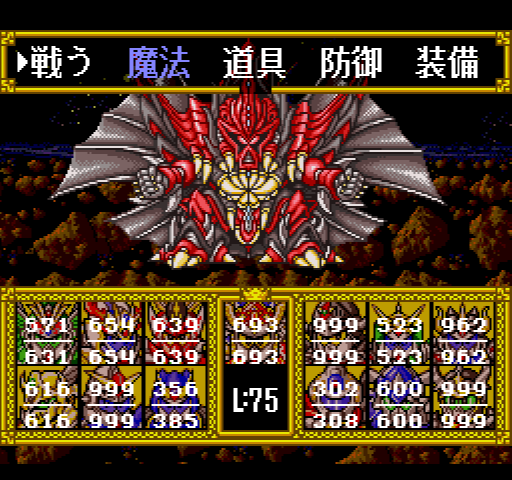 The battles always involve 3 monsters (except for the final boss of the area) and you have to beat the front monster before that fighter can go back to fight the back person. If you die in a battle, you just get sent back to a previous town. 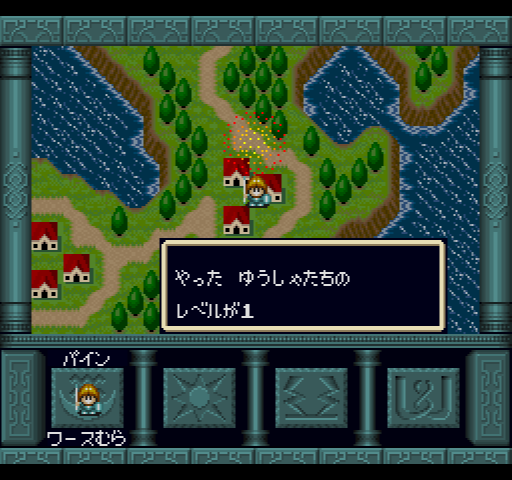 You can also choose "outside" at any point in a town/dungeon and you'll be returned to the world map with full HP/MP. This was a good choice by the designers because it makes exploring ahead less risky, although I guess it means a game over is impossible? The only disadvantage I've seen of taking a long time is that sometimes a boss will come out of a town to try to retake the towns you've already captured. If you're there it's not too bad because you'll be at full HP/MP, but if you died a lot and got knocked back to the starting town you might not be able to get up there quickly enough. I remember the controversy over FF12's AI system, but these kind of things have never bothered me that much. This is an abstraction of the usual RPG system of this era, which gives the illusion of more choice than you normally have. Yeah it's frustrating when the healer doesn't get the heal spell off in time, but that happens in other RPGs too. After freeing several towns, you get the second party. Pyne's party is ice/water-based, the second party is fire-based. 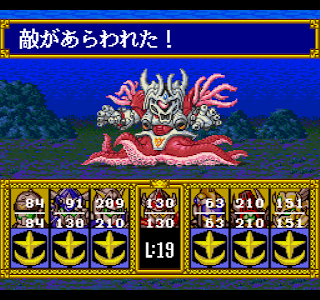 Each party is strong against certain monsters and weak against others, so depending on what monsters are in a particular town (and the boss) you might want to use one party over the other. 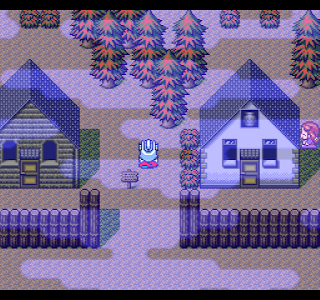 In addition to the towns, there are "natural areas" which are optional but have useful chests and maybe some drops from the monsters. This chapter has a cave and a forest. 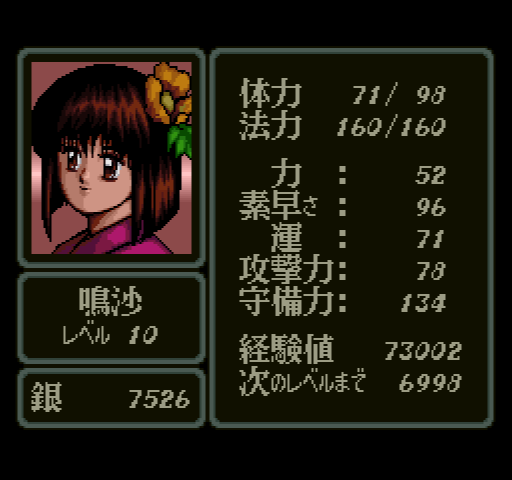 Now with the second party I can use them against some of the "tenma" monsters that Pyne's party isn't as good against. 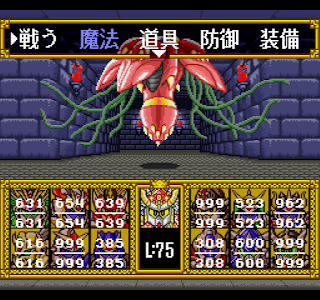 Often in the towns with multiple bosses, you can make several runs into the town -- sometimes you have to flip a switch to open a gate, or you can beat one boss and retreat. Eventually we have to send Aldis' party in to retrieve the Proof of Fire and replace it with the Blue Gem that Ell gave us at the beginning. This will stop the enemies from spawning in this area and now it's just a matter of beating the final boss of the region. 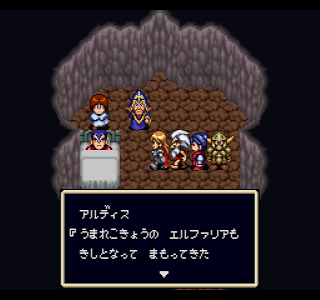 In Kana Castle we meet the sleep-loving king. 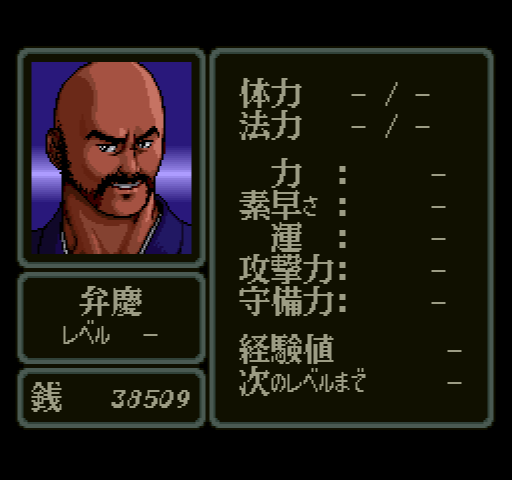 I used Aldis as my main frontperson in this place because a lot of the enemies are "tenma" type. The soldiers tell us there are some hidden rooms in the caves and castle (fortunately they're easy to find). 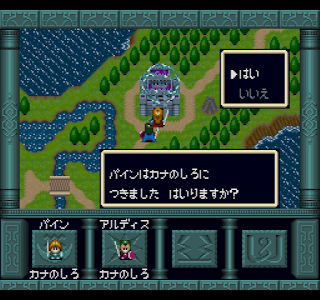 Going through the cave lets us open a switch to go in the main castle, then we have to do another runaround to open the switch into the final room. Now it's time to exit one more time and take on the boss,Yonapis. He was fairly easy. It's just him alone, and Aldis' party matches up favorably with him. 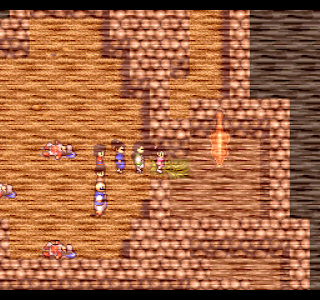 After the fight, Kanarn is freed from the evil powers. 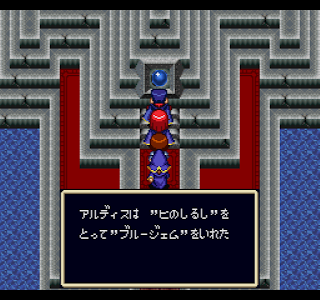 We get a quick cutscene with Searal (on the throne), Zora the mysterious wizard, and Dalukan, a knight of Elfaria who defected to Searal's side. Time for chapter 2, where we'll get the third party. I feel like I shouldn't be enjoying the game as much as I am. 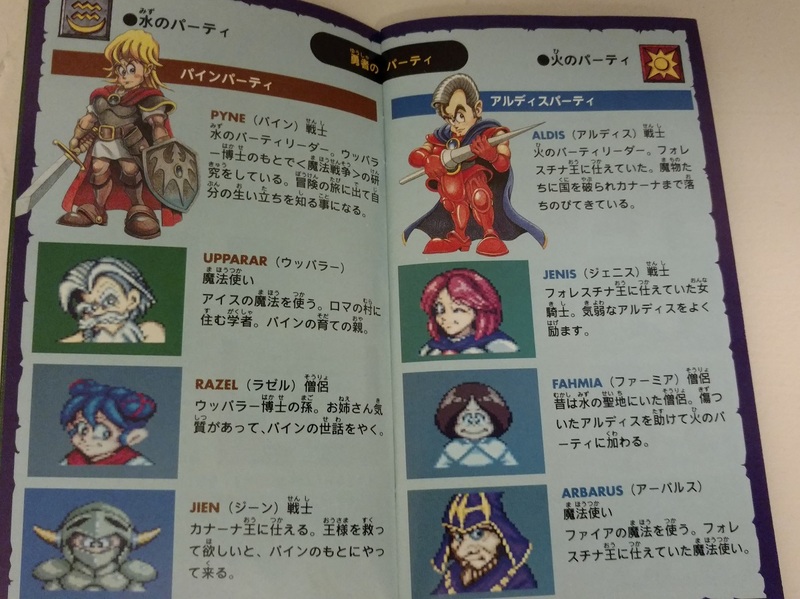 Hanjuku Heroes: Aa, let the word be half-baked! It needs to have individual, named characters that you can develop, not just generic troops. I played this game for a bit and it definitely qualifies for the first criteria, but I'm not sure about the second. There is no experience points, and I can't tell how (or if) the characters can develop. 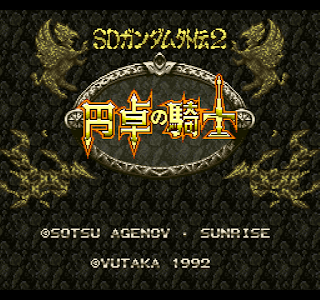 The Japanese list of RPGs I've used does not have this game on it even though it's usually pretty expansive. 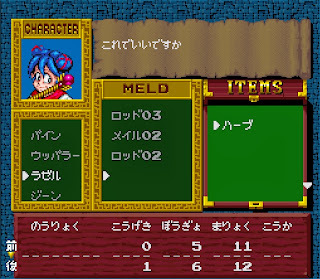 I debated whether to play this -- there's not much recognition of it in English and it seems to be a fondly remembered game in Japan. In the end I decided to skip it for now because I feel like I need the instruction manual to do it justice. Maybe I'll come back to it at some point. It needs to have some element of exploration, not just stages. I think this game fits criteria 3 but I'm not sure about 1 and 2. In any case it was released in English so I'll skip it regardless. 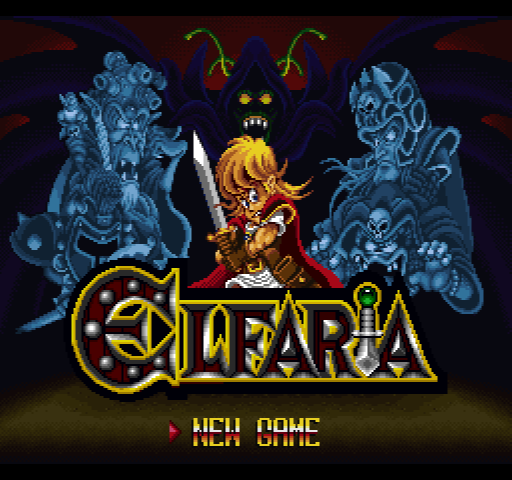 Next up then is Elfaria, a game that tries to buck the usual RPG trends (no XP or money!). I'll have the first post on Saturday. 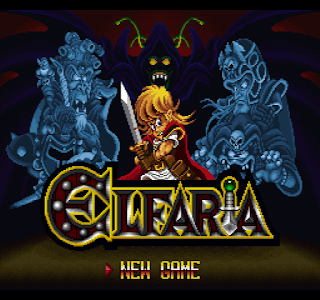 This game took me less than 5 hours to beat so I'm just going to make a review post to cover the whole thing. 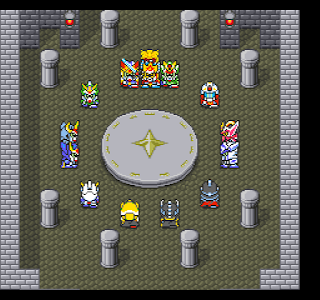 This is another SD Gundam game; you can read about the Knight Gundam franchise in the post I made for the first game. This is what's known as a "chara game", a disparaging term for a game that is only interesting for people who are familiar with the franchise. I agree with that assessment; it's not very good. 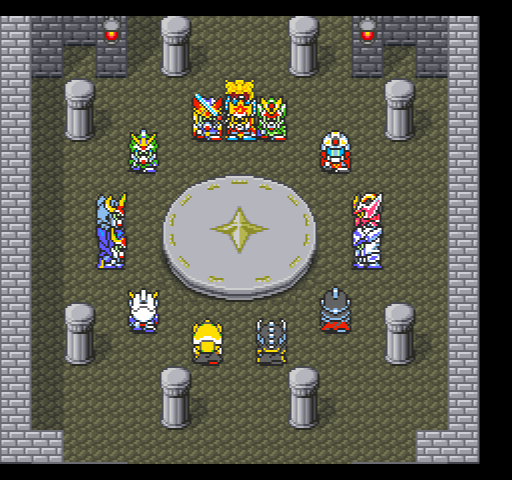 Story/Characters: The story is that you are a descendant of King Gundam and you have to free the British Kingdom from the rule of the Zabolonia Kingdom. That's pretty much the story. 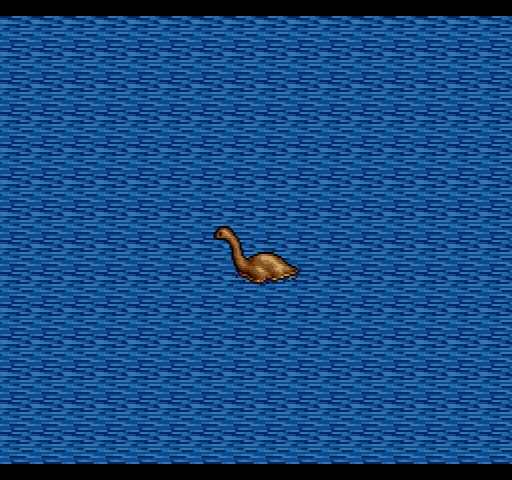 You progress through the game, and there's not that much in the way of interesting twists. You go back in time, and there is a little bit of interest there, but not much. The main problem is that it's hard to care about the story because the characters barely exist. 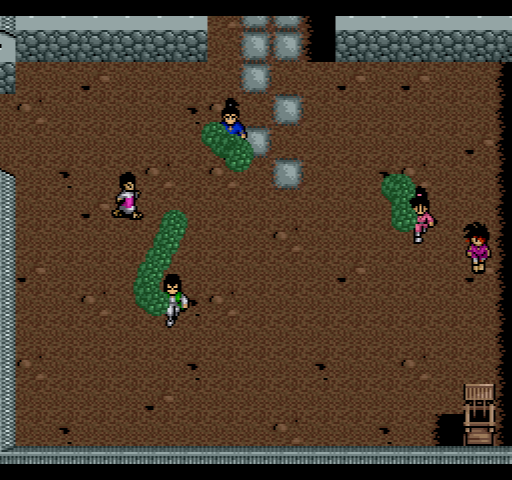 As is common with these chara games, they try to cram as many of the source characters as they can into the game, meaning that they barely get any development at all. It's hard to tell the difference between the characters, and the link between this and the original Gundam is tenuous. World: Generic fantasy. There's very little attempt to build any kind of world, explain what these Gundams are and why they exist in a fantasy world, or distinguish between different towns and castles. Game Flow: Despite the game being so short, there are some really annoying parts. There are hidden staircases you have to find by searching specific points on the map, and you're given no clues whatsoever to the find them. There's a forest where you can't see the paths, and it took me 25 minutes to get through that. However, since you can run from every random battle and the treasure chests are not all that useful, you can progress quickly. Especially if you use the cheats (see next entry). 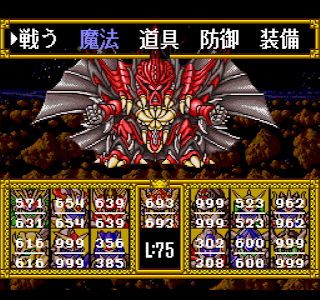 The final boss is easy -- he uses an attack that takes 4 turns to charge but you just wail on him for 3 turns then defend on the 4th. 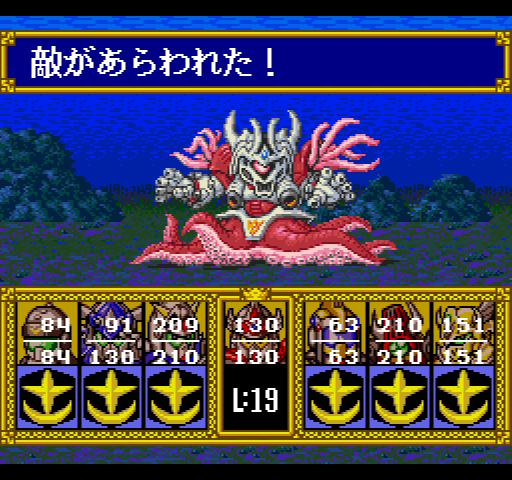 System: The battle system is standard attack-defend-magic RPG. You can have up to 13 people in your party, but do you really think it's fun to mash A 13 times in a battle? They tried to do something innovative by removing experience. Instead, you move up levels by recruiting new people into your party. I don't really like the way that works -- money isn't that useful so it means that there's really no purpose to fighting the random battles. Even if you did the game would be 10 hours at most. The other unique aspect of the system is the "order made" weapon system. You can create weapons by paying money to add points in various categories. But this doesn't really matter because then you get to name the weapon, and there are bonuses for having certain characters in the name. Seems like a neat idea but the bonuses are ridiculous. 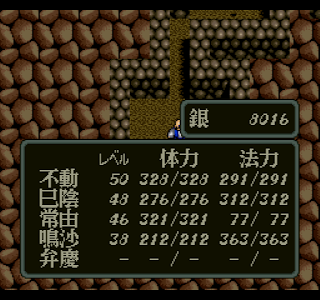 If you have the kanji 盾 (shield) anywhere in the name the weapon gives +100 defense, which is higher than the best armor in the game. 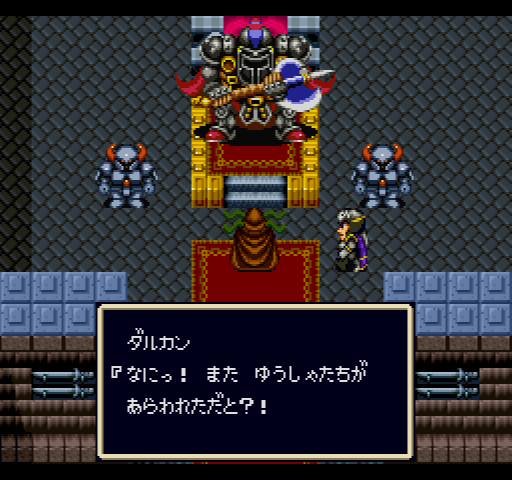 最強の剣 (strongest sword) does indeed make the strongest sword in the game. There are other bonuses, and they all stack. 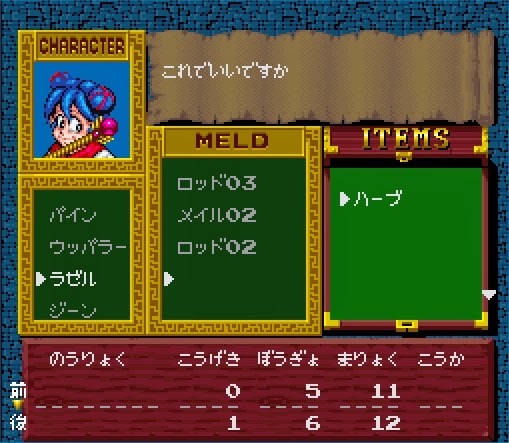 So in the first town, for 1 gold, you can make a weapon that is better than anything else in the game for both attack and defense, and you can add poison, stat bonuses, etc. I usually don't exploit things like this but since this game is bad already I had fun doing it. Side Quests/Optional Content: There is a bit here -- some optional characters (you can get up to level 99, I only hit 75). In the time travel part there are some things you can do in the past that you can then revisit in the present and future. Interface: This is OK. You can see the stats of weapons and armor before buying them. There's a unified use button. Graphics/Sound: The enemies look pretty good -- there's a lot of detail in the mechs and since they already had existing Gundam models to work off of there's not a lot of palette swapping. The music is average. Next up is Hanjuku Heroes, which I don't think qualifies as a strategy RPG but I may make a post on it anyway. Story/Characters: The story is a legendary take on the invasions of Japan by Kublai Khan in the 13th century, but also involves Benkei and Yoshitsune. I'm not sure that Benkei and Yoshitsune's roles in the story really justifies the title, but I guess Benkei's name sells more copies? 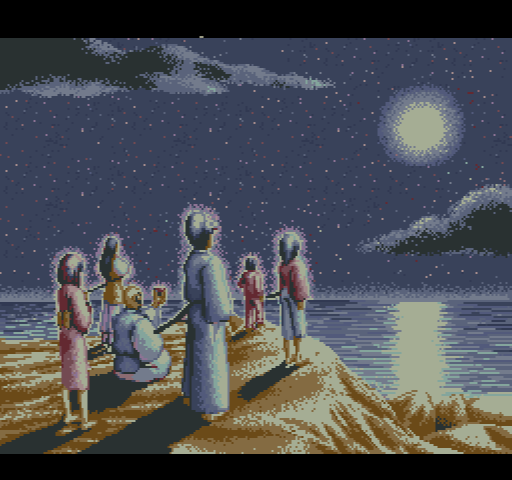 Overall the story is interesting and the pre-modern Japan setting is unusual for even Japanese games. The characters are relatively cookie cutter, as you would expect of a game from this era. World: You start in Japan and then move to China later. 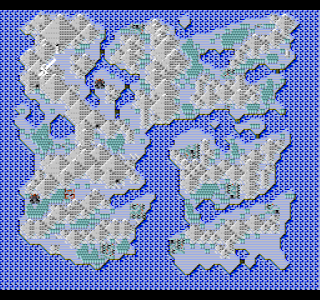 The world map is based on the real world and the towns are roughly in their real places. There's an attempt to evoke the pre-modern feel with very few Western loan words and monsters based on Japanese and Chinese mythology or folklore. Game Flow: Overall this is fine. The biggest problems I had were figuring out where to go next -- often the game isn't very clear about this. When you just have to move on to the next town that's not so bad, but sometimes you have to backtrack, and I wasn't always sure after looking at the walkthrough how I was supposed to know what to do. The boss of the first part is a grinding wall, which then makes the next part really easy. 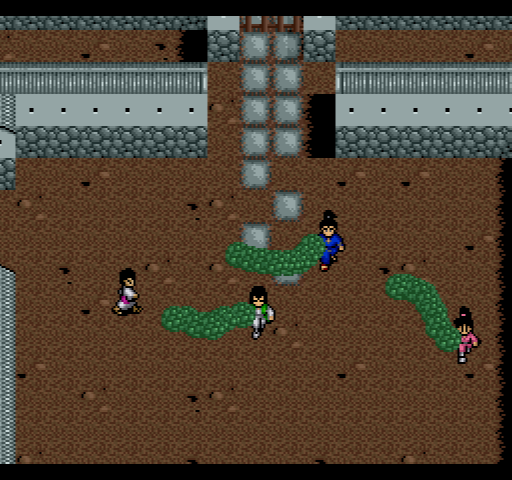 System: It's a basic RPG with a Japanese-themed skin. My biggest complaint here is that in the second half of the game, just using buff spells and regular attacks is much better than the damage spells, and Tokoyo's sword techniques become nearly useless. In many cases for me they did less damage than regular attacks. Side Quests/Optional Content: There's a hidden town in China with a weapon store but that's about it. Interface: Not as smooth as it could have been. I don't know why you have to first pick "examine" in the stores to see the power of the weapon/armor, and then buy it and have no idea how it compares to your current gear. 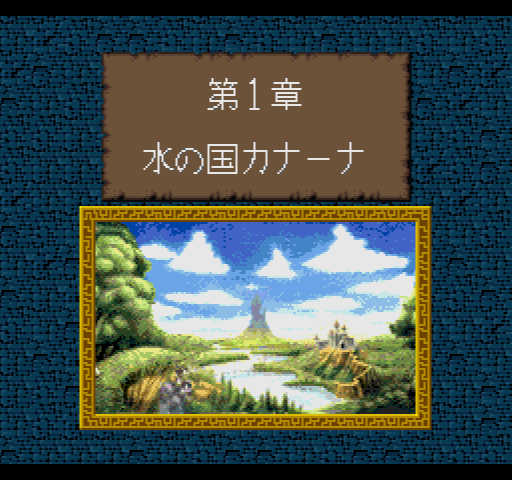 Dragon Quest V did it right -- can't all the other games copy off of that? We're also back to not having a unified "action" button so you have to choose "search" from a menu. At least there's no inventory limit. Graphics/Sound: Both have an Asian feel. The music is Japanese-sounding in the first part of the game and then changes to a more Chinese sound when you go to China. 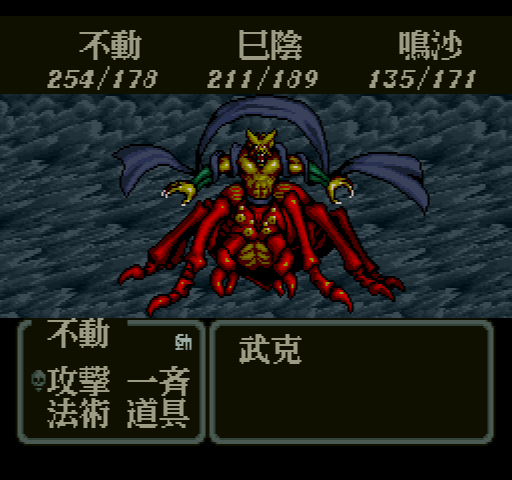 The monsters are detailed and interesting, and being able to see your characters slash their swords on the bottom is a little more interesting than just text. Overall an average game from this era; nothing particularly special. 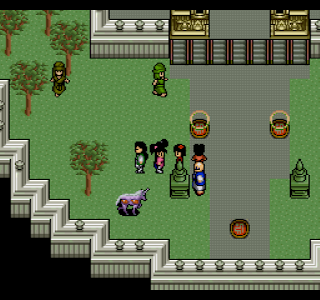 The second part of this game takes place in China. According to the instruction manual the designers went to China for background research -- or did they just want a free vacation? All the music changes to more Chinese-sounding music, your weapons all get taken, and your money gets replaced with Chinese money. There's no explanation for how your characters can speak Chinese. Our goal is to find Kunlun, the mythical mountain. Supposedly Yoshitsune is waiting there for us. I found the sequence somewhat disconnected -- one of the flaws of this game is that it's not always clear what you're supposed to be doing next, either from a story or gameplay standpoint. This is especially a problem when you have to backtrack, because the backtracking is often based on something you heard 3 hours of gameplay ago that has no direct connection to where you are in the game now. I had to use a walkthrough quite a bit in this section just to learn where to go next; maybe if I had taken detailed notes on what everyone said I could have figured it out. Since Kunlun is said to be at the source of the Yellow River, our first task is to find out how to go upstream. We start off in Lin'an, and our hope is that the Wokou pirates will help us out with a ship -- they are Japanese, after all. After paying some money for the ship, Fudou goes aloneto an island, but the Spirit General Bukoku attacks and defeats her, and she wakes up in a village. A boy Byakuren joins our party; he wants to get to Kunlun to beg the gods to stop the war. 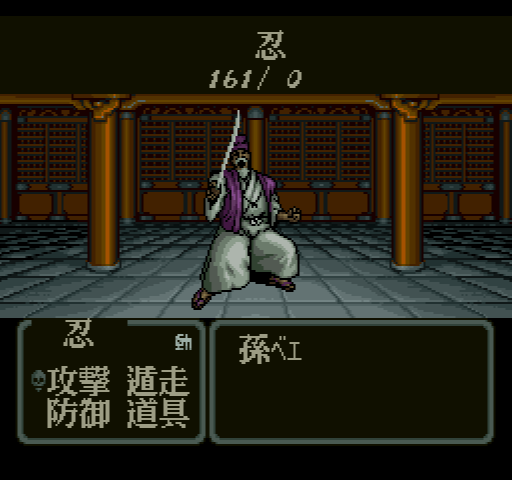 He's like Benkei in that he just pops up to attack during combat. He's pretty useless. 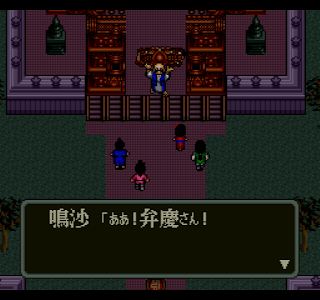 Fudou quickly reunites with the party, but Tokoyo has been captured by Bukoku. 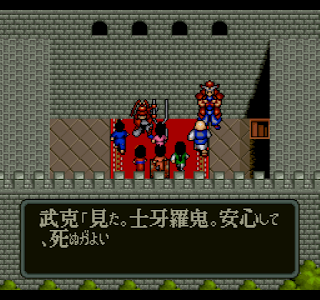 We also hear that Kublai Khan is being used by the Spirit Generals in order to bring back the Demon Castle. 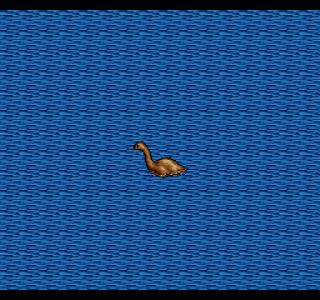 After some fetch quests, the Wokou let us borrow Hou, a sea monster that can ride up the Yellow River. Hou. I don't know what the source of this monster is. This is where I feel like the progression starts taking too many detours. 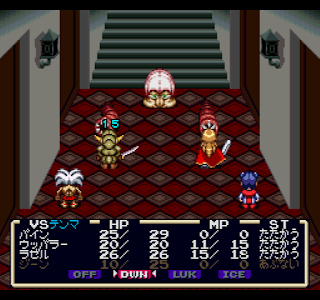 We have to awaken ghosts of dead soldiers to pass through an underground lava river, fight a flame dog boss, and then finally get to the castle where Bukoku is holding Tokoyo. Maybe if you're more familiar with the Chinese mythology this all comes from it makes more sense. This is a tough fight. One other big flaw in this game is the lack of good revive options. 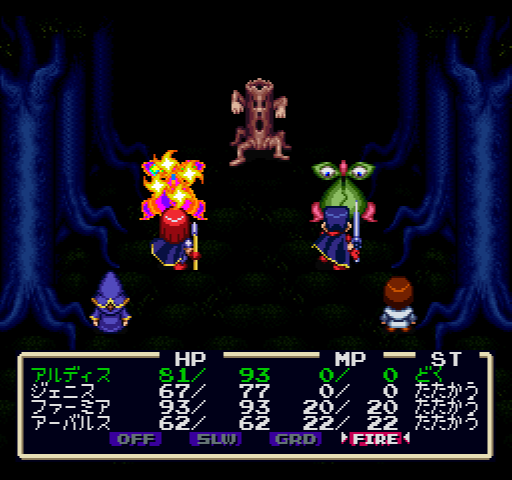 When enemies have group attack spells, it can be very difficult to resurrect a character and then heal them before they die again. 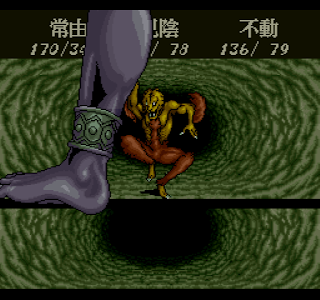 Since enemies often randomly get multiple attacks and criticals, it's easy to get screwed over by luck. I think the fact that I had to grind levels so much for Jugon (the boss of part 1) made it a bit easier, though. 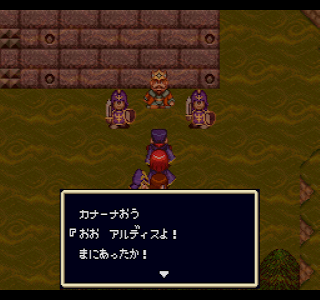 At the top of the castle is Bukoku. He's much easier than Jugon. 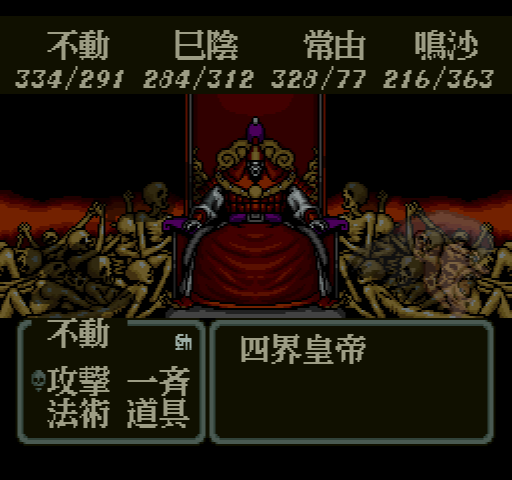 For the most part my boss strategy from this point on was the same -- use strength buffs and heals, and forget about damage spells or Tokoyo's sword techniques (which often do less than a regular attack). Depending on the boss, Stopspell can be useful as well as the defense buff or the "reflect magic" buff. 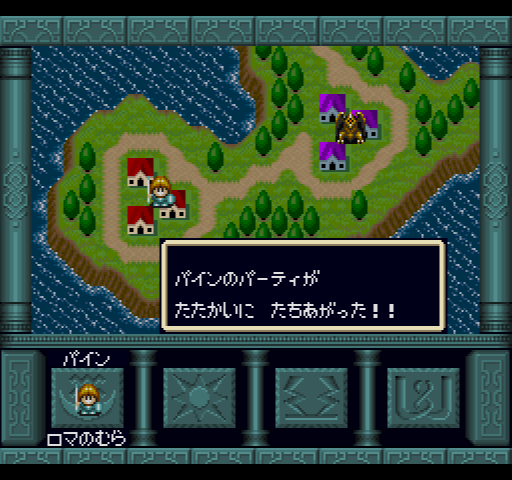 With Tokoyo back in the party we continued up to the capital city, although there's nothing to do there at the moment. Instead we head to the Great Wall, where they've managed to decipher some old stones. One is yet undeciphered but somehow Meisa can read it -- it's in Kunlun language. 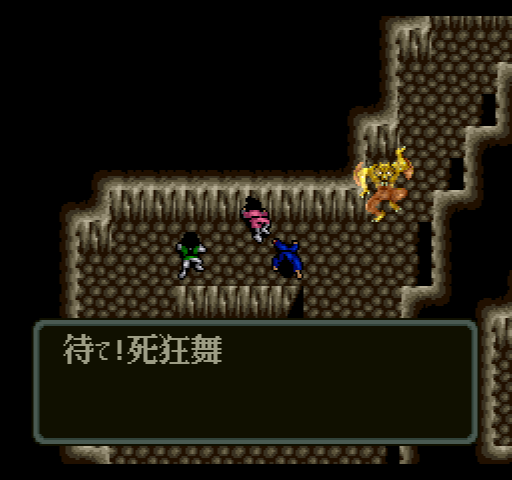 Unfortunately Bukoku shows up again (they can't die as long as the Demon Castle is around), and has one of his minions fight us. Now we know where to go in order to get to Kunlun, but we still need a flute to open the way. So we continue up the Yellow River, and meet Chizam, the head of a Mongol troop. He seems suspicious of Kublai Khan's actions. 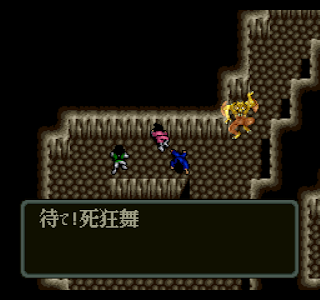 Finally we reach the end of the Yellow River (or at least what we can access) and have to go through a cave, where Bukoku once again challenges us...but by now he's easy. A detour brings us to Rakaku, one of Jugon's servants from part 1, but he's now become a priest. He challenges Fudou. He uses a lot of debuffs and heals which is annoying -- I had to try a few times and use a lot of the Shiki items to beat him. 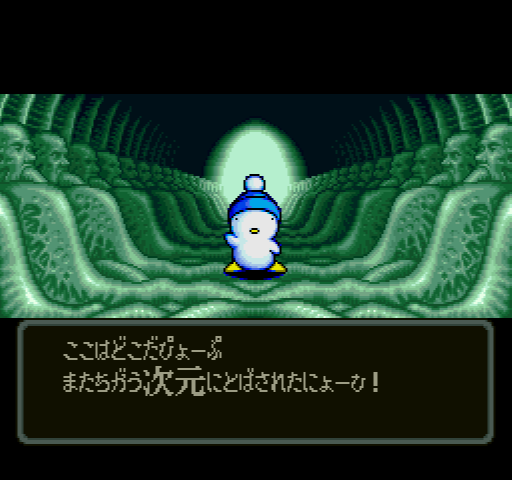 But he gives us a seal which will prove useful at the end of the game. 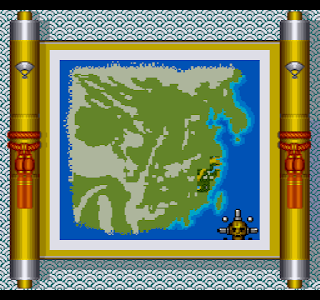 Afterwards there's a cave that has a map showing us exactly where to use the flute in order to gain access to Kunlun...which would be nice if we had the flute. 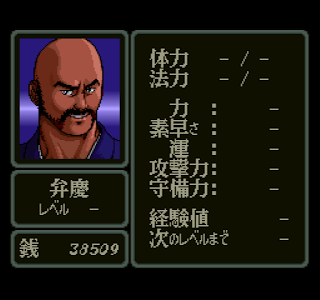 Continuing on, we meet the next one of the Spirit Generals, Jako. She(?) 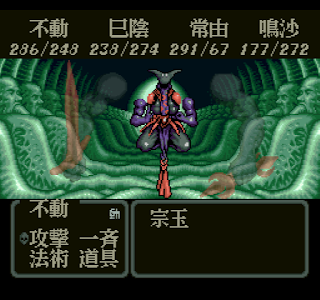 sends us back 1000 years to the Jama Taikoku, where Himiko tried to use the Mirror but ended up calling forth an evil power that would be around until someone went to Kunlun. Not sure why Jako wants us to know about this, but of course we manage to get back to the present. Jako meanwhile has killed Chizam and many of the mongol forces. Apparently they are indeed using Kublai Khan, and once Khan calls forth the Demon Castle they will kill him. Back in the present we reach the final stage of the journey. Jako once again tries to kill us but Hou sacrifices his life to open the way. With that, the last obstacle is gone and we recover the flute. With that we can go to the lake and open the path to Kunlun. Kunlun is a magical place of happiness where the animals talk. It turns out that Meisa is actually the sister of the leader. We learn that Yoshitsune is no longer there -- he and Genghis Khan were allied at first but were turned against each other by the Demon Castle and apparently killed each other (although later we learn that they defeated the Shikai Emperor so I don't know exactly what happened here). 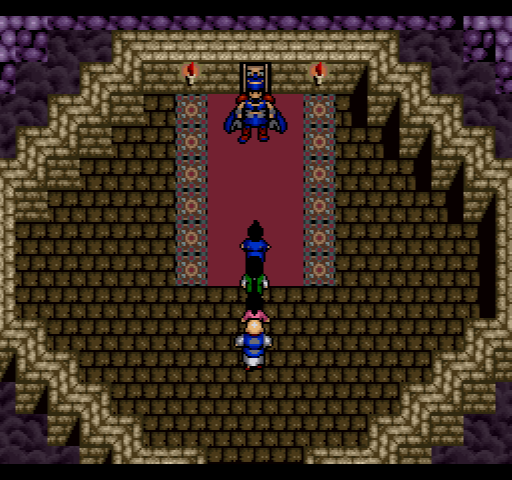 Kosa, the leader, gives you the ring necessary to open the way to the Demon Castle and defeat the Shikai Emperor again. Back on Earth, we go to the Capital, where the door is. Unfortunately Jako reappears and takes the ring. Byakuren is able to recover it, but Jako kills him. And then we can use the item Rakaku gave us earlier to go back to the Jama Taikoku and the final dungeon. 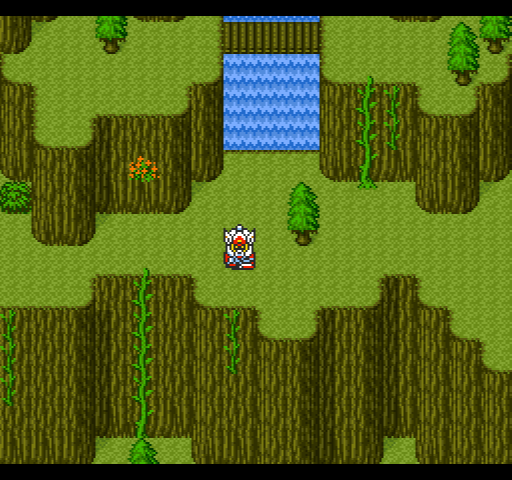 Here we have to face all four of the Generals again, although fortunately there is a heal and save to go back to. Then it's the final boss, the Shikai Emperor, who inhabits the body of Kublai Khan to fight us. The ending is pretty short. 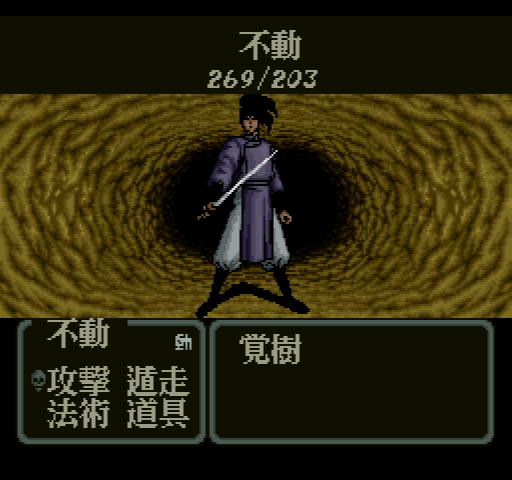 With the Shikai Emperor dead, Kublai Khan also dies, and we escape the Demon Castle. 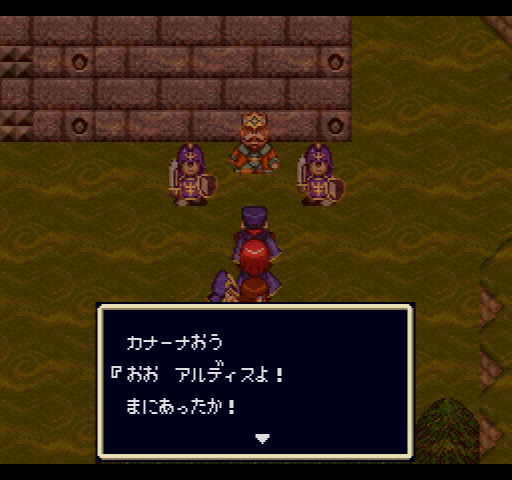 Benkei has to sacrifice himself to let us go, but he promises he won't die. Kunlun goes away for another 1000 years, and Meisa makes the decision to come to Earth rather than staying in Kunlun. She lives in a village we visited earlier where someone mistook her for his lost daughter. The others go back to Japan and resume their lives, and never meet again. Fudou loses the "Suna lineage" powers and returns to her village to be a normal woman again. Overall not a bad game, although not great either. Certainly just being average puts it ahead of most of the games I've played so far. I've finished the first part of the game. 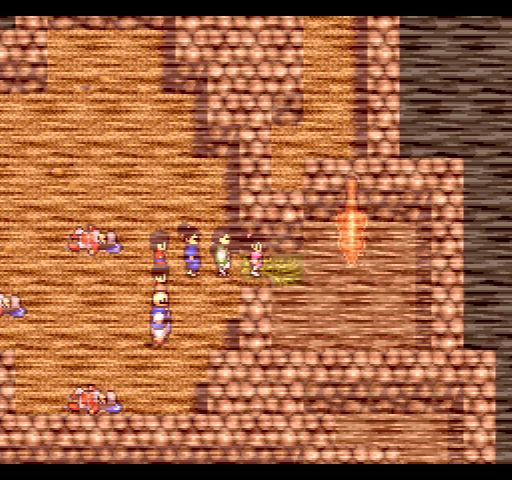 At the end of the last post I was heading to the mountains to find the Kasumi clan for help. They want us to prove our worth by recovering the bone of the sea dragon, and we get the item to open that dungeon. 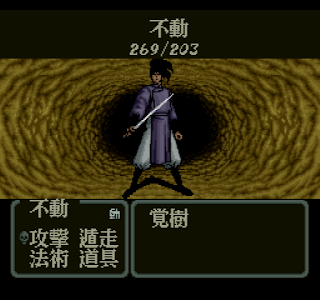 That's not very hard, and fortunately we can now use the bone to cross to Kyushu, where we'll supposedly find Jugon's base and the Spirit Ring. Now in Kyushu, we meet a one-eyed girl named Shinobu, but she doesn't want our help. 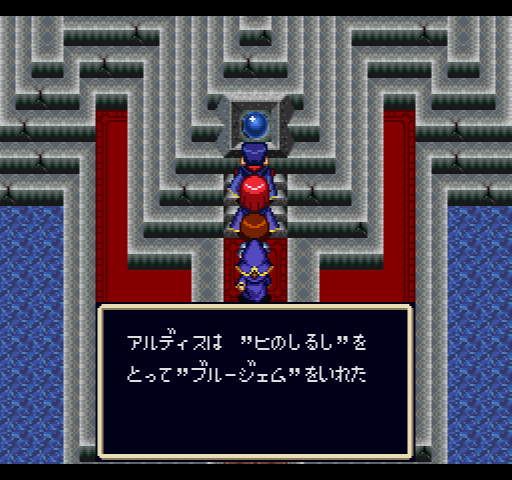 Instead we follow a guy named Enjo to Sakura Island, where he's supposed to lead us to more of the five Spirit Rings we're seeking. Instead he betrays us and lets us get captured by some sort of demon plant. Fortunately, Shinobu arrives to save us. Now we learn that Shinobu is in fact Princess Shino, who blinded herself for some reason (to increase her power or something, but that seems like a bad choice). Unfortunately her father and a close childhood friend have gone over to serving Jugon. We head to the Demon Castle to recover the Purple Ring, and that's where the friend (Magobe) and her father are. You have to fight both of them one-on-one with Shinobu but it's not very hard. 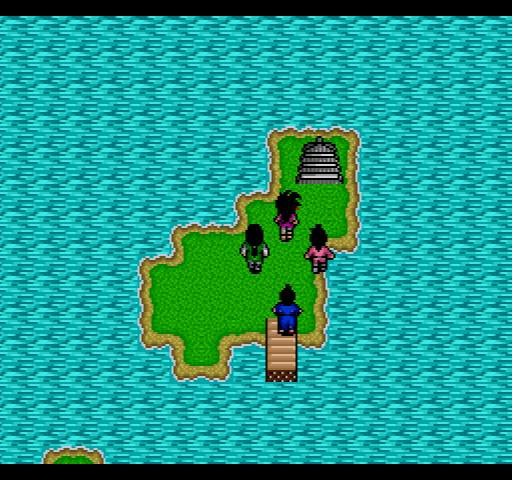 Afterwards we recover the Purple Ring, and the castle on Sakura Island is reclaimed for Shinobu and her clan. Next we head off to Hokkaido. While we were in Kyushu, the Kasumi clan was attacked and destroyed, but their remnants are in Hokkaido. There we learn about the Orange Ring, which we can recover in the East Cave. 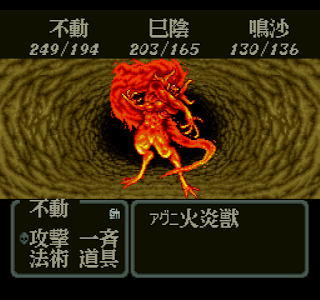 The cave has no boss and someone in the cave simply gives it to us, but then we have to fight a fearsome boss on the way out (who actually isn't very hard). Now that we have the rings, it's back to Shikoku where we started to revive Benkei. As you can see, Benkei is not a full party member. 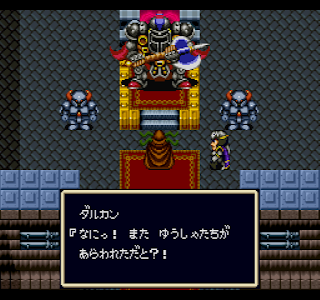 Instead you collect weapons for him, and he randomly appears in battle and uses them. Sometimes they attack everyone, sometimes just one person, and I think it's completely random whether he arrives or not. Seems like not much benefit for all the work it took. 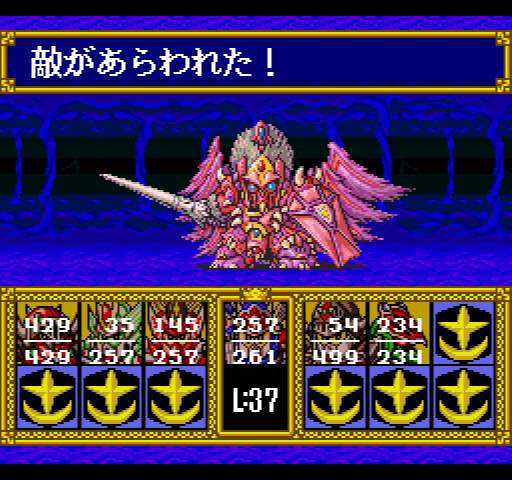 Anyway, the Kyubu monster from above returns in a more powerful form, and he's actually a pretty tough boss. 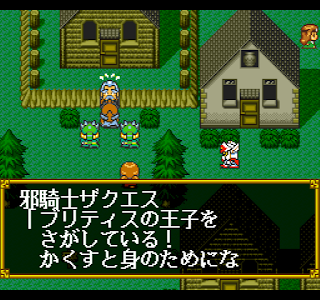 With Benkei's help he's defeated, and now finally we can head to the Kamui Ruins in Hokkaido to face Jugon. 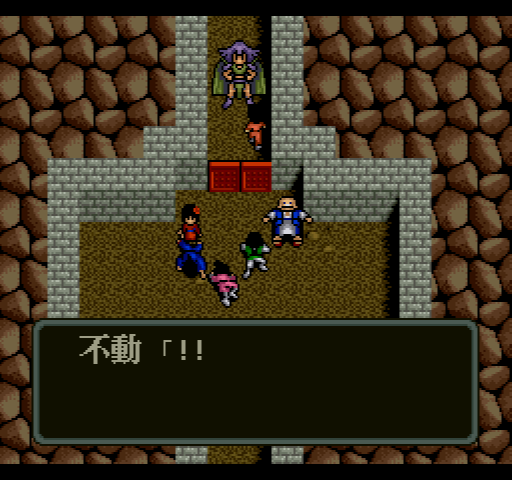 Benkei destroys the barrier in the dungeon. Jugon is waiting for us at the bottom. He takes us into some sort of spirit world and then we fight him. This is a really tough boss fight. 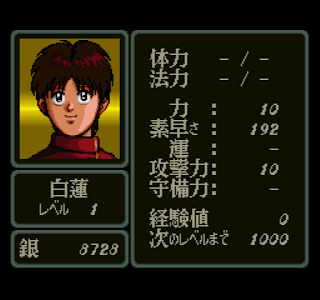 I had to level up to 30 to be able to beat him, and buy 99 shikis. 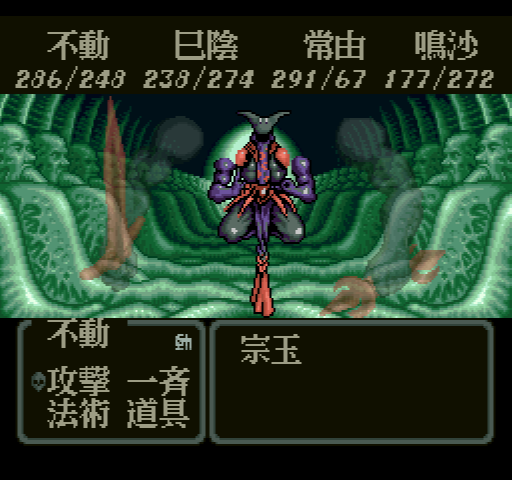 Fudo does about 500 damage with the 10 shiki move, so that's 4500 from her, and he has about 7800 HP. She can do a bit more damage with the remaining 9 shikis, but the rest of the damage has to come from random Benkei, and then buffed up attacks from Tokoyo and Mikage. The Earth Medicine helps a lot since it restores all HP to all characters. There is some luck involved as in a lot of battles, though, since all the characters randomly do multiple attacks -- I haven't been able to figure out when or why this happens. But the monsters can do it too, so someone can go from full HP to 0 in one round. Jugon informs you that the Mirror has already been sent to China, so it's too late to do anything. 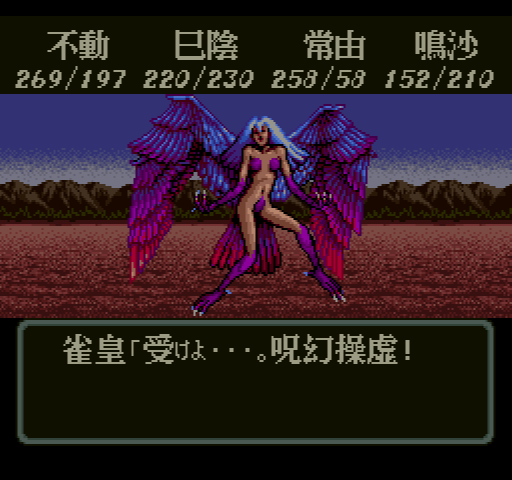 We then learn that Meisa has recovered her memory -- she is from Kunlun, and was sent by Yoshitsune from China to bring Benkei and the other heroes back. So our next destination is China. 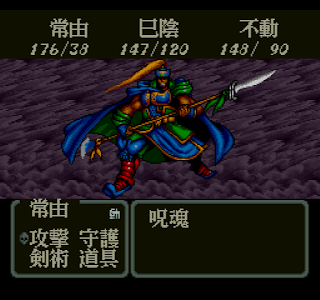 There's also a cutscene where someone (I think Kublai Khan?) 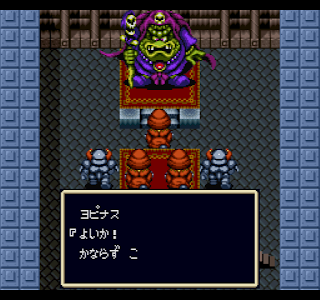 is telling the remaining three generals (minus Jugon) to beware of Benkei's arrival. With the destruction of the Tower of Light, Japan has lost the means for calling the divine storms. Kublai Khan, knowing this, prepares to invade Japan for a second time, preparing 140,000 troops and 4400 ships, much more of a force than last time. Hojo Tokimune prepares all of Japan's strength in North Kyushu to counter this. At the same time, Fudo and the others take Meisa and travel to China. Their destination is Kunlun, a legendary place of mystical illusions. But Kublai Khan's otherworldly servants are waiting to stop Fudo. Hopefully I can finish the game this week, but we'll see.